Some 400 million years ago, 50 million years after the appearance of the first land plants, fossil evidence reveals that insects were feasting on plants. The earliest terrestrial vertebrates, the amphibians, dating back some 360 million years, initially fed on fish and insects, and later expanded their diets to include plants. Herbivores are animals that have adapted anatomically and physiologically to eat plant material as a major component of their diet, which provides a rich source of carbohydrates. To thwart the efforts of these herbivores, and to enhance their own survival and reproductive fitness, plants have evolved physical and chemical defense mechanisms that can deter, injure, or even kill their predators. But just as plants evolved, the herbivores co-evolved, too, to overcome or reduce the effectiveness of these defense mechanisms and enable themselves to continue their plant diets. 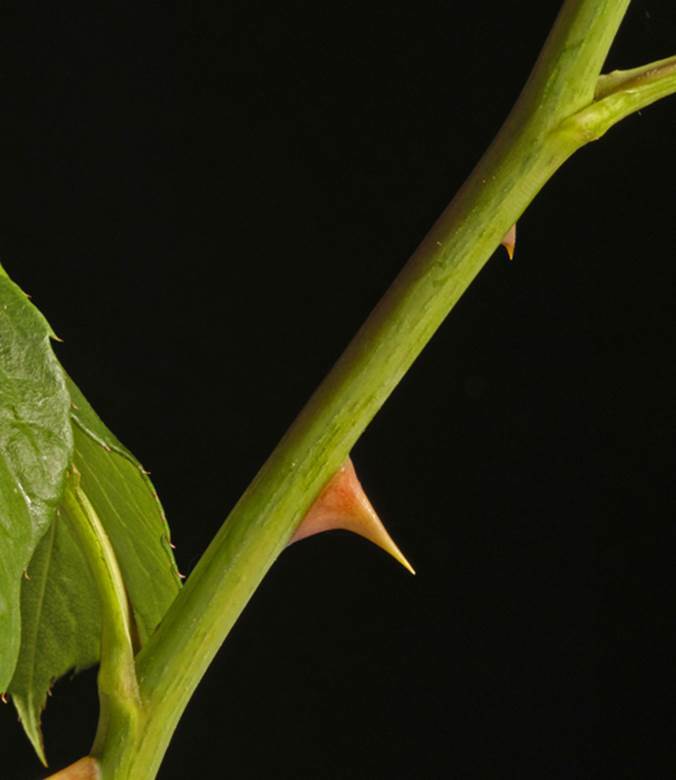 Physical defenses or mechanical barriers, such as the thorns on the stems of roses and the spines on cacti, are intended to deter or injure herbivores. Trichomes are hairs that cover the leaves and stems of plants and represent an effective deterrent to most insect herbivores, although some insects have evolved counter-defensive mechanisms. Waxes or resins that coat plant parts serve to modify their texture and make cell walls difficult to eat and digest. The chemicals produced for defensive purposes are by-products of plant metabolism and are secondary metabolites that do not participate in such fundamental functions as growth, development, and reproduction. Rather, they promote the long-term survival of the plant by acting as herbivore repellants or toxins. Among these chemical types are those classified as alkaloids and cyanogenic glycosides, and both contain nitrogen. Alkaloids are derivatives of amino acid metabolism and include such familiar chemicals as cocaine, strychnine, morphine, and nicotine, the latter long used as an insecticide in the garden and agricultural fields. Alkaloids adversely affect herbivores by modifying the activity of their enzymes, inhibiting protein synthesis and DNA repair mechanisms, and interfering with nerve function. When herbivores feed on plants containing cyanogenic glycosides, hydrogen cyanide is released, which poisons the cellular respiration of the would-be predator. SEE ALSO: Land Plants (c. 450 Million BCE), Insects (c. 400 Million BCE), Amphibians (c. 360 Million BCE), Metabolism (1614), Nitrogen Cycle and Plant Chemistry (1837), Coevolution (1873), Enzymes (1878), Mitochondria and Cellular Respiration (1925). Thorns, spines, and prickles are plant structures with sharp, stiff ends, which are used to mechanically deter herbivores. Although these terms are commonly used interchangeably, botanists distinguish them based upon where on the plant they originate. These prickles were found on a rose.